Run of 30 copies and 5 trial proofs in approx. 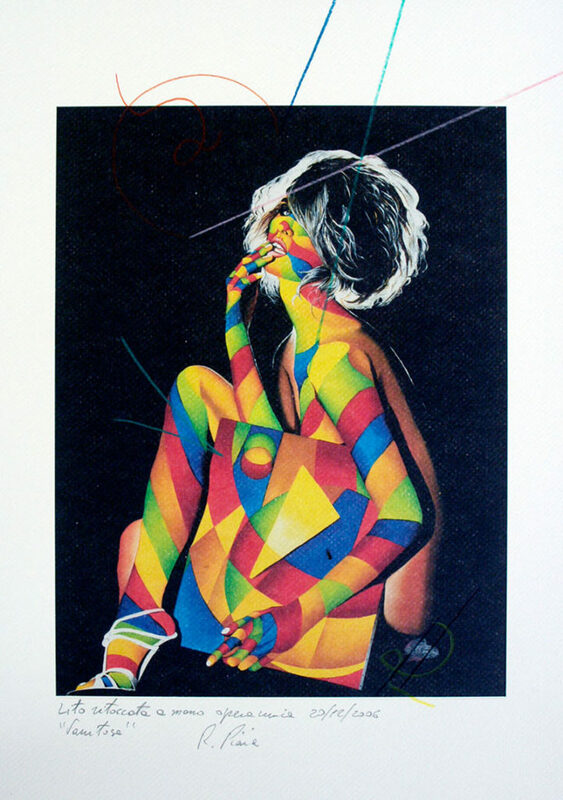 22 colors in screen printing techniques, involving both material and selected printed parts in four colors, with active intervention by the author Roberto Piaia. Dimensions 39×26 e 26×39 cm. Information: certificate of authenticity and guarantee signed and stamped by the attached artist. Lust Serigraph 39 x 26 cm. Greed Serigraph 26 x 39 cm. 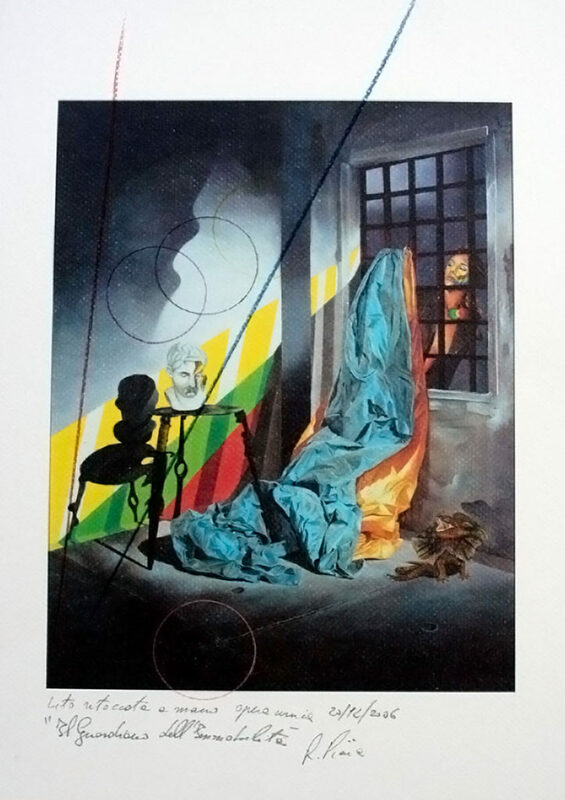 Accidie Serigraph 39 x 26 cm. In these highly suggestive pictorial works, Roberto Piaia joins his favorite theme, the female figure, with that of the Seven Deadly Sins. About, they are a preview of a larger project which is dedicated to Dante’s Inferno. All this might seem an ironic “use” of the female figure, but surely it is not! Her favorite pictorial subject is still the woman, who represents beauty for him, not only exterior, strength and sweetness. 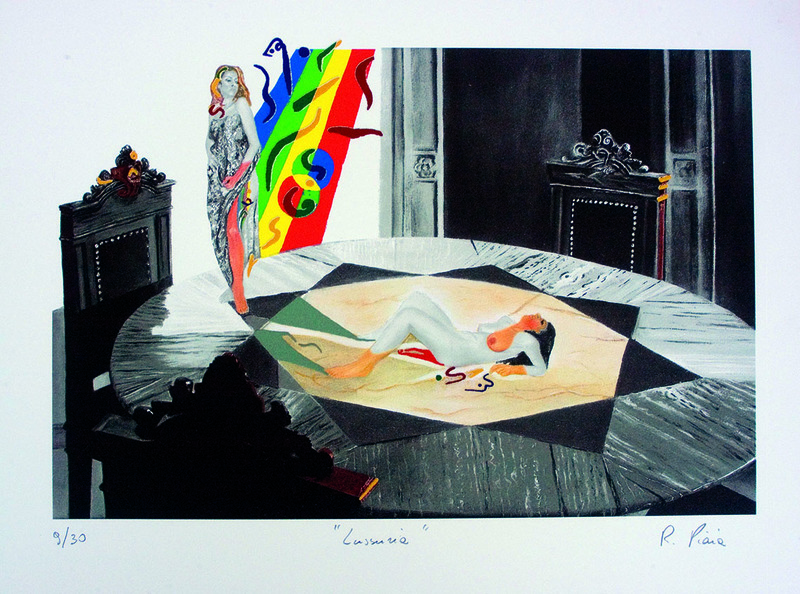 Eg, here, at the centre of the seven representations we see an untouchable femininity, framed in a surreal world. Where symbolism imposes itself in a way not instantly visible but requiring further attentive scrutiny. In no way do we find Dante’s misty scenes, but rather a vision of our existence. A form of precise warning with subtle irony, showing not only the concrete representation of each sin but also its retaliation. Pride Serigraph 39 x 26 cm. Anger Serigraph 26 x 39 cm. Envy Serigraph 39 x 26 cm. Gluttony Serigraph 26 x 39 cm. 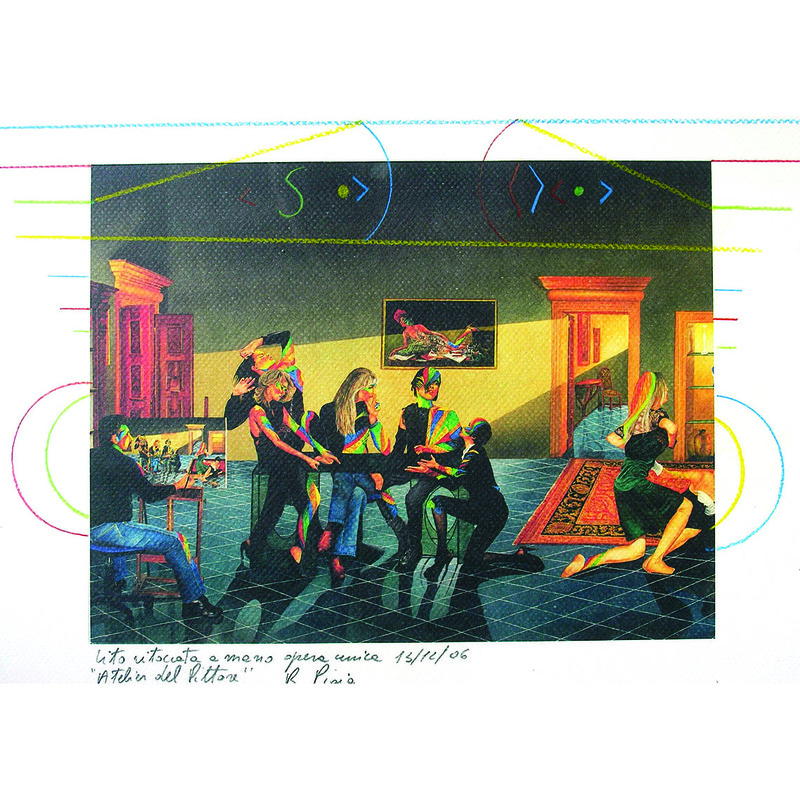 Serigraphs: Greed, Envy, Lust, Gluttony, Accidie, Pride and Anger are discussed in diverse scenes. Let’s start with Gluttony: a fully laid where one cannot eat. Then Envy: a pile of books which symbolize the envy of knowlledge. Pride follows: a narrow cave where a sterile discussion takes place. Then Accidie: a bottle which appears to be a psychological prison. Later Greed, a cave full of stalactites and stalagmites like an array of arms. Finally Anger: radiant and stormy like a scream. Anyway, on each of these backgrounds we find the beautiful blond woman, often in conversation with a dark haired woman. Of course, the abstract quadricromatic band is ever present, representing the seal of the artist personal style. Roberto Piaia defines his research using the term ‘Assurfivo’, meaning the fusion of three pictorial genre: abstract, surreal and figurative. Each of these works offers a perfect visual example of the artist’s definition. 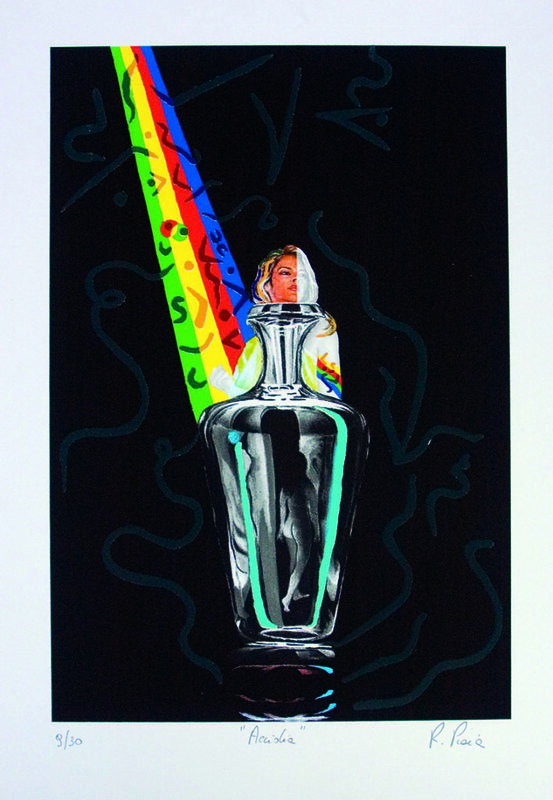 Two serigraphs in 22 colors with material parts. In the same way, selective prints in four colors and line art. Even with active intervention by the artist. The Violin: 76×57 cm. and Ecstasy: 65×43 cm. Certificate of authenticity and guarantee signed and stamped by the attached artist. Lithographic reproductions on textured paper of oil paintings on canvas created by Roberto Piaia. Regarding lithographic reproduction, the artist is based above all on the request of collectors, in particular of some works. As the artist paints only unique works on canvas. Lithographs reproduced with a 1/100 numerical limitation. 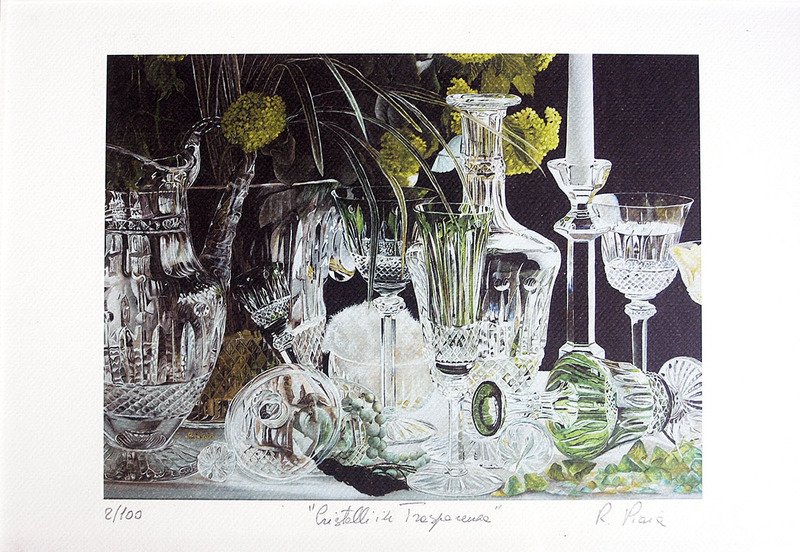 Crystal glass in Transparency, 35×50 cm. Piaia’s transparencies are hyper-realistic visions. Particularly the perfectly measured compositional balance – that could be said to adhere to the classical lesson of XVII century Flemish painting. The hyper-realistic depictions provoke visions and sounds, because when looking at them you can see distinctly through your eyes the tinkling of crystal. This particular work of art is from the artist’s ‘yellow period’. That is a moment of change and chromatic evolution in the use of primary colors. The Painter’s Studio, 35×50 cm. The original work has always been much appreciated by collectors but also by critics and organizers of any event. In 2006 the organizers chose the image as an advertising emblem of the exhibition dedicated to Roberto Piaia, for a poster of 450 square meters. The Keeper of Stillnes, 50×35 cm. In addition to the mastery to recreate objective reality with oil paints, you will discover symbolic messages. It could be read, releasing a persons’ personal imagination.